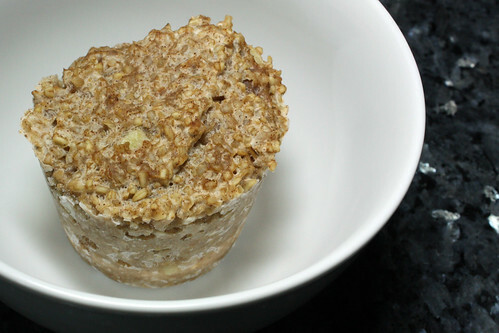 Okay, I haven’t perfected my oatmeal cupcake yet. When I do it will be legendary, but I may have to turn to the world of molecular gastronomy if I want this baby to keep its shape after a spin in the microwave. What I have perfected, though, is the weekday morning breakfast. It’s no secret to anyone that weekday morning breakfasts have gone very literal: all the do is break our nighttime fast and keep us going until we have our first real meal at lunchtime, or dinner if lunch is a grab-and-go affair. I “work” from home (I’ll remove the quotes after I get a publishing contract), I have a love and appreciation for breakfast born of watching so many people be nourished by our two-course offerings at the Inn, and even I have a hard time sitting down to something substantial most mornings. Sure, sometimes I’ll make myself an omelet and realize how little time it takes, but any reform is usually short lived. Within a week, I’m reaching for the cereal box again or just waiting for lunchtime. 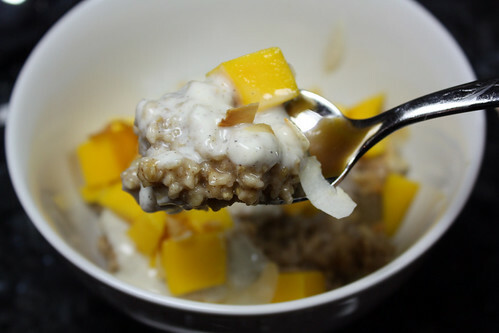 This entry was posted in Breakfast, Cooking, Featured and tagged leftovers, oatmeal on March 15, 2009 by Jessica Petersen.